The topics in this section describe properties and methods specific to 3D cubes, pie graphs, stock graphs, bubble graphs, funnel graphs, multi-Y axis graphs, Pareto graphs, and waterfall graphs. CubeFocusFactor (0...100); This property sets the focus factor for setting perspective distortion in a 3D graph. CubeIsometricProjection (true/false); This property enables (true)/disables (false) isometric projection. CubeLightSourceX/Y/Z (0...100); These properties set the cube light source for the X-, Y-, and Z-coordinates (unit space). CubeProportional(true/false); Define the axis size proportional to the number of series (false) or groups (true). CubeRiserInterpolation(); This property controls whether risers in 3D graphs are interpolated (faster) or explicitly calculated (more accurate). CubeSizeX/Y/Z (0...100); These properties set the size of the 3D cube in the (user) X-, Y-, and Z-directions. CubeTranslationX/Y/Z (0...100); These properties set the translation of a 3D cube (in 3D cube coordinates) in the X-, Y-, and Z-direction. CubeViewerX/Y/Z (0...100); These properties set the viewer location (in 3D coordinates) in the X-, Y-, and Z-direction. CubeWallThickX/Y/Z (0...100); These properties set the thickness of the 3D-cube wall in the (user) X-, Y-, and Z-direction. CubeZoomFactor (0...100); This property sets the global scaling factor for zooming in/out. Display3DFloor (true/false); This property enables/disables the display of the floor of the cube in a 3D graph. Display3DLeftWall (true/false); This property enables/disables the display of the left wall of the 3D cube. Display3DRightWall (true/false); This property enables/disables the display of the right wall of the 3D cube. Viewing3DAnglePreset (-1...15); This property selects an entry in the table of preset viewing angles for 3D graphs. Graph Types and 3D Preset Viewing Angles includes an illustration of each of these preset viewing angles. Also see 3D Grid Lines and Riser and Marker Properties for information about properties that you can use to control the appearance of grid lines and risers in the 3D cube. OtherPercentage(0...100%); This property sets the percentage at which a slice in a pie graph will be grouped into the other slice when the OtherSeries property is enabled. OtherSeries(true/false); This property enables/disables the bundling of small slices (less than OtherPercentage) into a single slice that is labeled other. PieDepth (0...100); This property specifies the depth of the pie crust in a pie graph or a funnel graph. 30 is the default value. PieFeelerTextDisplay (0...3); This property enables (true)/disables (false) the display of feelers and data text in a pie graph. PieFeelerTextFormat (0...14); This property determines the format of values that are drawn next to feelers in a pie graph. PieLabelDisplay (0...3); This property determines the format of labels displayed next to feelers in a pie graph. 1 is the default value. PieRingSize (0...100); This property determines the size of the ring (inner circle) in a ring pie. 30 is the default value. PieRingTotalDisplay (true/false); This property enables (true)/disables (false) the display of a total value in the center of a pie ring graph. PieRingTotalFormat: When the PieRingTotalDisplay property is set to true and the total data value is displayed in the center of a ring pie graph, this property sets the format of the data value. PieRotate (0...359); This property rotates a pie or funnel graph a specified number of degrees. 0 is the default value. PieSorting(0...3); This property defines the order in which pie slices are drawn. PiesPerRow (integer); This property specifies the number of pies to be drawn in a row in multi-pie graphs. 2 is the default value. PieTilt (0...100); This property tilts a pie or funnel graph a specified number of degrees. 15 is the default value. PieBarSeries (0...# of Series in graph); This property selects the series that will be used to map the bar in a pie-bar graph. 0 is the default value. get/setPieSliceDelete(); These methods get/set a boolean value indicating whether or not slices have been deleted from a pie graph. get/setPieSliceDetach(); These methods get/set the distance that slices are detached from a pie graph. restoreAllSlices(); This method restores all detached/deleted slices from a pie graph. isChartPieType(); This method returns a boolean indicating whether or not the GraphType property is set to one of the pie graphs. DataTextTemplateHiLo; This property assigns a special format macro to data text labels when they are enabled for display in a stock graph. Stock52WeekHighValue(); This property gets and sets the 52-week high value assigned to a stock graph. Stock52WeekLowValue() This property gets and sets the 52-week low value assigned to a stock graph. Stock52WeekHighDisplay (true/false); This property enables (true)/disables (false) the display of a 52-week high line in a stock graph. Stock52WeekLowDisplay (true/false); This property enables (true)/disables (false) the display of a 52-week low line in a stock graph. StockCloseSplitDisplay (true/false); This property enables (true)/disables (false) the display of split risers at the stock close value. StockCloseTicksDisplay (true/false); This property enables (true)/disables (false) the tick marks at the stock close value. StockMovingAverageDisplay (true/false); This property enables (true)/disables (false) the display of a moving average line in a stock graph. StockOpenTicksDisplay (true/false); This property enables (true)/disables (false) the tick marks at the stock open values. StockTickLength (Integer); This property determines the length of tick marks in a stock graph. ViewableGroupsStock: This property specifies the maximum number of groups to be imaged in a stock graph. ViewableSeriesStock: This property specifies the maximum number of series to be imaged in a stock graph. isChartStockType(); This method returns a boolean indicating whether or not the GraphType property is set to one of the stock graphs. DataTextTemplateBubble: This property assigns a special format macro to data text labels when they are enabled for display in a bubble graph. QuadrantLineCountX: This property selects a number of quadrant lines on the X-axis in a bubble graph. QuadrantLineCountY: This property selects a number of quadrant lines on the Y-axis in a bubble graph. getQuadrantLine(); This method gets the object ID of the quadrant lines in a bubble graph. getQuadrantLineValueX(); This method gets the vertical location of an X quadrant line. getQuadrantLineValueY(); This method gets the horizontal location of a Y quadrant line. setQuadrantLineValueX(); This method sets the vertical location of an X quadrant line. setQuadrantLineValueY(); This method sets the horizontal location of a Y quadrant line. A funnel graph is basically a pie graph that shows only one group of data at a time. The series in the group are stacked in the funnel with the first series at the top and the last series at the bottom. You must set which group of data you wish to display. Funnel labels (frequently referred to as the series labels). The following property defines which group to display in the funnel graph. 0 is the default value. The following property defines the location of labels in a funnel graph. Can be set to a value in the range 0...2. 0 is the default value. Labels on top of values drawn on the right of the funnel. Labels on the left of the funnel/Values on the right of the funnel. Values on the left or the funnel/Labels on the right of the funnel. setPieDepth(0...100); Sets the depth of the funnel graph. 30 is the default value. setPieRotate(0...259); Sets the length of the funnel tip. 50 is the default value. setPieTilt(0...100); Sets the amount of tilt toward the viewer. For every funnel graph, it is recommended that you set the transparent border color of the graph frame to true. This overrides the default behavior (normally false for other graph types) of showing a black rectangle around the frame and will create a better looking funnel graph. GaugeBackgroundStyle; Defines the style of the gauge background. GaugeDescending; Draw gauge values in ascending or descending order. GaugeIgnoreBackgroundStyle; Ignore/obey the GaugeBackgroundStyle property. GaugeMajorAutoStep; Enable/disable automatic calculation of the number of major grid/tick steps. If this property is disabled (FALSE), Y1MajorGridStep defines the number of major grid steps. GaugeMajorTickRelativeTickLength; Get/set the relative length of major ticks. GaugeMinorAutoStep; Enable/disable automatic calculation of the number of minor grid/tick steps. If this property is disabled (FALSE), Y1MinorGridStep defines the number of minor grid steps. GaugeMinorTickRelativeTickLength; Get/set the relative length of minor ticks. GaugeNeedleStyle; Get/set the gauge needle style. GaugeRelativeInnerRadius; Get/set the relative size of the inner radius. GaugeRelativeThickness; Get/set gauge's relative thickness. GaugeStartAngle; Get/set gauge start angle. GaugeStopAngle; Get/set gauge stop angle. GaugeTitlePosition; Set the title positioning. See How to Set the Title Position in a Gauge Chart. 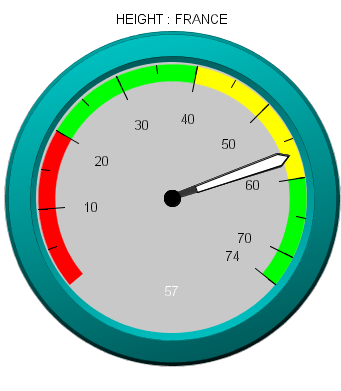 The setDisplay() method displays the value of the gauge on its background. See How to Control the Display of the Value in the Gauge Chart. The setY1ExcludeMinLabel() method displays the minimum value of the gauge on its background. How to Control the Display of the Minimum Value on the Gauge Scale. The setY1ExcludeMaxLabel() method displays the maximum value of the gauge on its background. See How to Control the Display of the Maximum Value on the Gauge Scale. 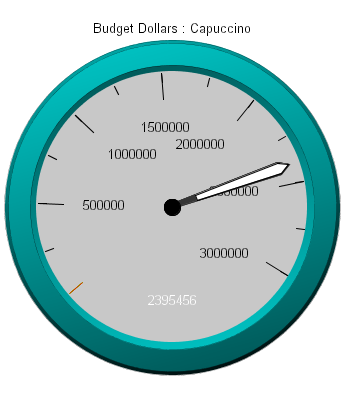 Also see the Gauge Graph objects. 1 places the title below the chart. 2 places the title in the center (this is the default). 3 places the title above the chart. Is either true or false. When newValue is true, the gauge value displays on the gauge background; when it is false, the value is not displayed. The default is true. When newValue is true, the minimum label is not displayed on the gauge scale; when it is false, the minimum value displays. The default is false. When newValue is true, the maximum label is not displayed on the gauge scale; when it is false, the maximum value is displayed. The default is false. In addition to dual-axes graphs, 3Y-, 4Y-, and 5Y-axes graphs (GraphType 103...105) are also available. Series must be assigned to the axes using setAxisAssignment(). By default, the series risers assigned to each axis are staggered. The AlignMultiYBars property can be used to align the bars on each axis. By default, axis labels are staggered with odd numbered (1/3/5) axis labels on the left and even numbered (2/4) axis labels on the right. These default settings can be changed with setAxisSide(). Is 0...100. 1 (automatic) is the default value. If the AxisSize is set to 0 (automatic) for all axes, automatic sizing of axes and offsets will occur. This is the default setting for each axis. In other words, axes and offsets will be sized proportionally dividing the available space of the frame evenly. If an even distribution between each axis is desired, there is no need to set the axis size or the axis offset. Is 0...100. 0 is the default value. With this feature, axes are allowed to overlap. In most cases this may not be a desirable effect. If the axis sizes are set to non-zero values, appropriate relationships between the offsets and sizes must be set. When you select a Pareto graph (GraphType 102), the X-axis scale is for group numbers. The Y-axis scale is the percent of the total accumulation for each selected series. Each graph displays a single series. Use the DisplayParetoSeries property to define the single series to be shown in the Pareto graph. The default Pareto series is zero. The ParetoDisplayThreshold property can be used to split the frame and accumulation line per the desired percent. (1...100). 1 (no split) is the default. The ConnectParetoBars property can be used to connect/disconnect the bars in a Pareto graph. When you select a waterfall graph (GraphType 100 (vertical) or 101 (horizontal)), groups within the graph are identified as subtotals, totals, or extra. The waterfall graph automatically performs the cumulative sum when using subtotal or total. Groups labeled as extra are ignored in waterfall calculations. Note: Values in a given group in a stacked waterfall must be all negative or all positive. Zero is treated as a positive number. If the data contains mixed signs, the sign of the first series controls whether the entire stack will be treated as all positive or all negative. See Data in a Waterfall Graph for more information about setting up the data required for a waterfall graph and restrictions. The setWaterfallGroupMode() method assigns each group in the data set to be graphed as a normal, a subtotal, total, or extra group. By default the group mode is set to normal. If a waterfall group is set to subtotal or total, the data for this group is ignored and the cumulative total up to this point is shown for this group. Only one group can be designated as total or extra. Total is computed the same way as a subtotal except there is only one of them. For the best visual presentation, the group designated as extra should be the last group in the graph. A group designated as extra is not used in performing any waterfall cumulative sums. It appears as stacked data.